The University of New Mexico's Latin American library collections and resources are among the best in the country. The collections are primarily overseen by the UNM University Libraries (UL), although substantial supplemental resources are also managed by the UL Center for Southwest Research and the College of Fine Art's Bunting Visual Resources Library. 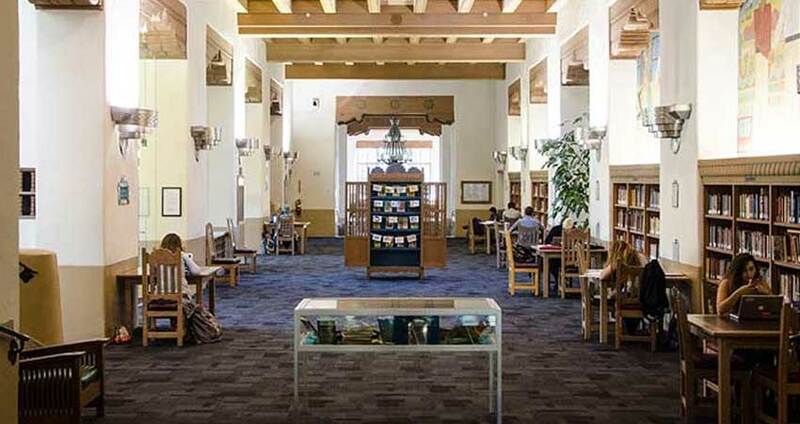 Overall, UNM libraries contain extensive print collections in Latin American and Iberian content, as well as Chicano, Indigenous, and Southwest studies. The Latin American Collections, housed within UNM's University Libraries, represent the strongest single part of UNM's library print materials with nearly 600,000 books in English, Portuguese and Spanish. A small but growing collection of sources in Latin American indigenous languages supplements these holdings, which are spread across all libraries at UNM. As one of the major repositories of Latin American resources in the United States, the Latin American Collections cover all of the social sciences, humanities, and fine arts as well as professional fields, including Business Administration. UNM's holdings for Latin American Art, Art History and Photography are widely recognized among the best in the United States. There are significant manuscript collections as well as substantial compendiums of silkscreen and photo-offset posters, engravings, lithographs, block prints, photographs and other creative and graphic works such as chapbooks and artists' books. These materials are held in the Center for Southwest Research and Special Collections (CSWR), located in Zimmerman library. Unique archival holdings on New Mexico as a contested territory of the Vice Royalty of New Spain (1598-1821) and independent Mexico (1821-1848) offer excellent opportunities for research in Latin American, Indigenous, Chicana/o and Southwest studies. We invite you to learn more by visiting the Latin American Collections website. In addition to the extensive general Latin American collection held by University Libraries, UNM is also home to remarkable collections of archival resources. Below is a summary of UNM's Latin American archival collections, with links to digital guides for researchers interested in learning more. We invite you to learn more by browsing the Special Collections website. The Center for Southwest Research and Special Collections (CSWR) is the special collections center for the UNM library system. Its collections are from New Mexico, the Southwestern U.S., Mexico, and Latin America, as well as rare materials from around the world. The collections focus on Native American, Chicano/Hispano, Spanish Colonial, and environmental history, and include a wide range of locally published and archival materials documenting the region. The CSWR contains more than 40,000 books and periodicals, many of them rare or out of print. Primary languages are Spanish and English, however, Native American language materials are also collected. Many of the CSWR special collections are comprised of silkscreen and photo-offset posters, engravings, lithographs, block prints, photographs and other creative graphic works such as cordel and cartonera literature. We invite you to learn more by visiting the CSWR website. The Bunting Visual Resources Library (BLVR) is a combined collection of over 450,000 digital images, color and black and white slides, and mounted photographs illustrating the history of art and architecture from prehistoric times to the present. Digital collection growth stems from faculty requests related to current teaching and research. Recent collection development has focused on contemporary Latin America, among other areas. We invite you to learn more by visiting the BLVR website.